Wunderschöne 2.000 m² große, handgefertigte Blockhausfassade auf über 10 Hektar Wald. Dieses ehemalige Anwesen auf einem Baumhof wird von 80 m hohen nördlichen weißen Kiefern überdacht. Genießen Sie die atemberaubende Aussicht auf den abgelegenen Quill Lake von der oberen Rundum-Deck, unteren abgeschirmten Seedeck oder mit dem Kanu, Paddelboot oder Kajak. Der kristallklare See erstreckt sich über eine Fläche von 486 Metern und ist 25 Morgen tief und 31 Meter tief. Ideal zum Angeln (Barsch, Barsch, Panfish und mehr) und zum Schwimmen. Friedlich im Nicolet National Forest gelegen, bietet das Haus und die Umgebung viel Privatsphäre. Genießen Sie nach einem Tag in Sonne und Wasser einen gemütlichen Abend am Lagerfeuer mit Blick auf den See. Um den Tag zu beenden, entspannen Sie im Whirlpool mit herrlichem Blick auf den Sternenhimmel. Dieses abgelegene Haus verfügt über vier Schlafzimmer, zwei voll ausgestattete Badezimmer, offene Küche und Familienzimmer, TV-Raum, drei-erfahrene Veranda und unteren Ebene abgeschirmten Veranda mit Ausstellerkeller. Waschmaschine und Trockner befinden sich in der unteren Waschküche. Das Haus am See ist nur die Straße hinunter vom 278 Hektar großen Maiden Lake und anderen umliegenden Seen entfernt. In der Nähe Einkaufsmöglichkeiten, Lebensmittelgeschäfte, Restaurants, Casino, Rad- / Wanderwege und ATV / Snowmobile Trails. Das Haus befindet sich eine Stunde und 15 Minuten nördlich / westlich von Green Bay, WI. Wir sind zuversichtlich, dass Sie jedes Jahr zurückkehren möchten, um bleibende Erinnerungen für Sie und Ihre Lieben zu hinterlassen. Ein WILLKOMMEN-Korb erwartet Sie in der Küche sowie einen Korb mit Pflegeprodukten in jedem Badezimmer, falls Sie vergessen haben, etwas zu packen. Eine Mappe mit lokalen Restaurants, Geschäften, Seen, Wanderwegen und Veranstaltungskalender ist vor Ort verfügbar. Anfragen für einen frühen Check-in oder einen späten Check-out können je nach Verfügbarkeit berücksichtigt werden. Best place in the area! Beautiful lodging and location. Views of Quill Lake are breathtaking. Home is well taken care of and in very good shape. Our family of 5, children ages, 10, 8, and 4 all found lots to do. We swam, fished, hiked, played outdoor games and had bonfires every night. Home and lake are both beautiful. We will be back. LarSan Lodge is a treasure! We're delighted to have found this spot. My family and I have been renting properties in the Northwoods of Wisconsin for over 15 years. This year we were a group of 7, with pets - three adults around 60, triplets aged 24, one lucky boyfriend and 3 Labrador Retrievers aged 12, 8 and 2. We needed a sizable place with plenty of sleeping space and room for dog kennels and such too. LarSan Lodge met our space needs easily. The lodge is well-equipped, very clean and beautifully decorated. There’s plenty of seating for lounging as well as for meals. Bedrooms are inviting and comfortable. The kitchen is spacious with everything for cooking at hand, and the view from the deck is unforgettable. Quill Lake is a great spot for canoeing, kayaking, wandering around in big float tubes, and paddle-boating. The paddle boat, one canoe and one kayak are provided, along with plenty of life vests. We brought along inflatable tubes and kayaks. If you don’t mind a bit of cold in the deeper waters, the lake is a great place to swim as well. We also love to fish, and during our week on Quill Lake we caught about 100 panfish large enough to keep. We enjoyed two generous and delicious fish dinners. The local roads make for a nice bike ride or run. In the evenings, we enjoyed marshmallow roasts in the fire pits and played a couple of the numerous games available. We never turned on the TV, though we did peruse the impressive DVD collection. Shopping for groceries, local crafts and anything you might need is within a 15-minute drive. 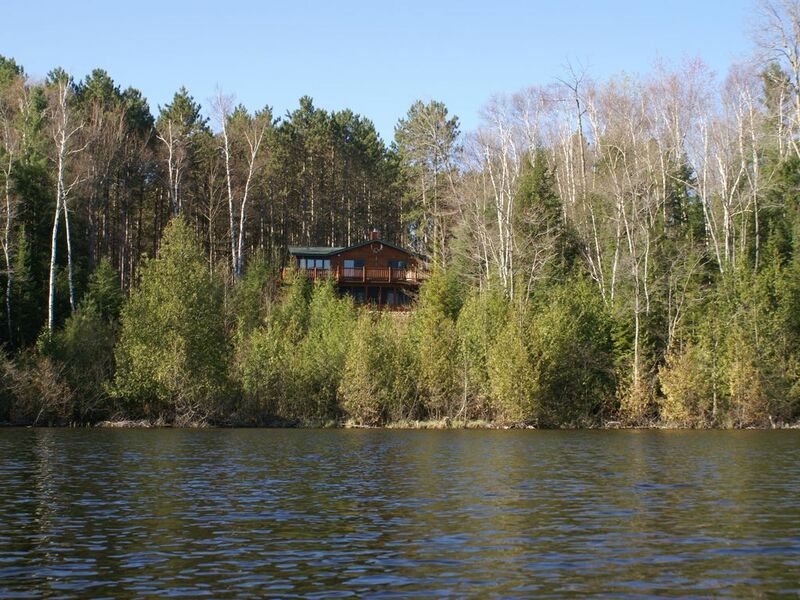 But, in spite of its proximity to civilization, the lodge and lake have a wonderful feeling of quiet and isolation. It’s a great spot to get away from it all. We recommend it highly and hope to return. We brought our large family up to the lodge and enjoyed a truly fun, relaxing vacation in the peaceful woods by the beautiful lake. The hosts and the property manager made us feel welcome and right at home from the moment we arrived. We had plenty of space for everyone to play, indoors and out, and the home was comfortable, cozy, and full of charming details (like the hummingbird feeder just outside the kitchen window). I enjoyed preparing special family meals in the well-stocked kitchen, and we enjoyed sharing them together on the porch or the the deck or around the fire pit. The lake was crystal clear and the kids (and grownups too!) had so much fun playing in the water and enjoying the kayak and canoe. We explored nearby hiking trails in the national forest, and, surrounded by the trees and the lake we felt truly "away from it all", while still being only a short drive from a grocery store and local restaurants. We feel lucky to have found this wonderful place, and hope to return again soon! Beim Check-in erhalten Sie in der Unterkunft einen Reiseführer für die Umgebung und alles, was Sie über LarSan Lodge wissen müssen. Requests for early check-in or late check-out may be considered based on availability.